Much-travelled striker Nathan Ellington is hopeful of securing a Crewe Alexandra contract after a month on trial with the League One side. Following his release by Ipswich in January, the 31-year-old former Wigan Athletic and West Bromwich Albion man has played three Under-21 League games for Crewe and scored in all of them. He told BBC Radio Stoke: "It would be nice to get something sorted. "But I'm just happy I've had the chance to come here and train and keep fit." Bradford-born Ellington, who has three times made seven-figure moves in a 14-year professional career that began with Bristol Rovers, has been without a club since having his contract cancelled at Ipswich on January transfer deadline day. "It's good for both parties at the moment," he said. "I didn't get to play too many games at Ipswich. "Crewe have always been a good footballing side. They're a club who do things the right way. A lot of players have moved on from here to bigger and better things. "But, looking from the outside, coming from the Championship to League One, it does not look like there is much difference and you never lose the hunger to score goals." Ellington has hit 144 goals in 329 career appearances and 168 as a substitute, since first making a name for himself at the Memorial Stadium. After scoring 44 goals in 95 starts for the Pirates, he earned a £1.25m move to Wigan, before making successive £3m moves to Albion, in 2005, then Watford in 2007. 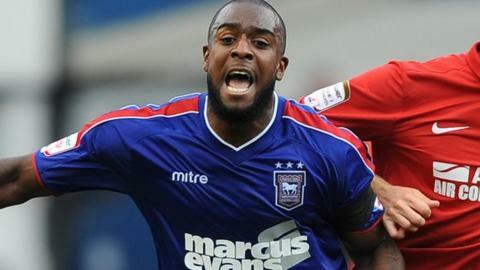 After a season-long loan at Derby followed by another at Preston, he left Watford for Ipswich in the summer of 2011. But he made just one league start in 18 months at Portman Road, was allowed out on loan to League One side Scunthorpe in November - and has not scored since April 2011.